The Chabad movement has doubled in size in almost every area in the past 15 years. Rabbi Krinsky credits the Lubavitcher Rebbe's vision. Rabbi Yehudah Krinsky has been named the most influential rabbi in the U.S., in an annual list of 50 Most Influential Rabbis in America published in Newsweek. The list is compiled by Sony Pictures chairman and CEO Michael Lynton and Gary Ginsberg, an executive vice president of Time Warner Inc. Rabbi Krinsky, administrative head of the Chabad-Lubavitch movement's educational and social services divisions, has been on the Top 50 Rabbis list since its inception in 2006, but this is the first time he has reached the number one spot. The movement has had no top spiritual leader since the passing of the highly venerated Lubavitcher Rebbe, Menachem Mendel Schneerson, in 1994, whose teachings and guidance continue to be effective today for millions around the world. 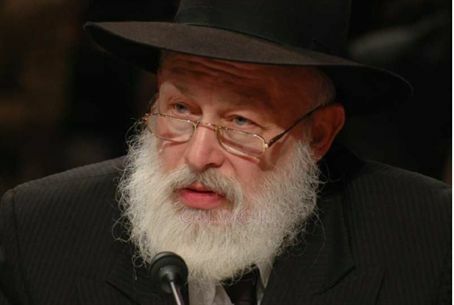 In 1957, Rabbi Krinsky was recruited by the Rebbe to serve as a member of his secretariat, later serving as corporate secretary of his three central organizations. These positions would give him unique access to the Rebbe over the next decades. Israel National News asked Rabbi Krinsky why he thinks was he chosen for the number one spot in the Newsweek list. "This is really about recognizing the Rebbe's gift to Jewish life,” he replied. “It is about the Rebbe's Shluchim [global Chabad emissaries], who work relentlessly to realize his vision. The Shluchim are 'soldiers in the trenches' who devote themselves with passion and creativity and genuine kindness to the material and spiritual well-being of their respective communities; it would be hard to imagine Jewish life today without the achievements of the Shluchim. They are the face of Chabad-Lubavitch today." INN: How has the Mumbai terror attack influenced the activity of Chabad's shluchim? Rabbi Krinsky: "It underscored the far-reaching impact that Shluchim have within their communities, and how enormously appreciated and needed they are. The outpouring of solidarity made it rather clear that Chabad Shluchim are universally recognized for what they represent, and for what they bring to their communities. Gabi and Rivki illustrated, by the examples they set in the way they lived their lives, the meaning of selfless living. So they were a tremendous inspiration not only to the thousands who've come through their door, but also to their fellow Shluchim. "The murder of Gabi and Rivki in their Chabad House was a personal tragedy for the Shluchim, but they regrouped immediately; the tragedy enlarged their sense of camaraderie which was always very strong; instead of becoming defeated, they deepened their faith, their identity as Shluchim, and their commitment to their life-work." Several weeks ago, Rabbi Krinsky announced the development of an Early Childhood Initiative, one of the first projects launched in the recent revival of Chabad's Machne Israel Development Fund, which was established by the Rebbe. The project, funded in part by a $5 million grant from David Slager -- "who recognized its value" -- is aimed at opening new preschools in the U.S., as well as additional slots in already established preschools, Mrs. Olidort said. "This is one of many projects on the drawing board, but the thinking behind it is inherent to all of Chabad's activities, which is to fulfill the Rebbe's vision by reaching every Jewish demographic and empowering everyone, from children to adults, from the marginally involved to the assimilated, with the tools to access their Jewish heritage."